Maurice Arthur Poole was born in Yeovil during 1900, the younger son of carpenter and joiner Arthur George Poole (1872-1953) and Ellen nee Hull (1871-1947). In the 1901 census Arthur, Ellen and 5-month old Maurice were recorded living in Orchard Street while their elder son, William Percy (known as Percy), was staying with his grandparents in East Chinnock on the night of the census. In the 1911 census the whole family, including Arthur's parents George and Sarah Ann Poole, were listed at 21 Orchard Street. Arthur gave his occupation as a builder, while both Percy and Maurice, aged 12 and 10 respectively were still at school. Maurice enlisted in April 1918 (presumably as soon as he turned 18), joining the Royal Air Force as an Air Mechanic 2nd Class. His Service Number was 160690. During May or June 1918 Maurice was posted to 'X' Aircraft Depot, Alexandria, Egypt. The depot was under Lt Col N Goldsmith and received aircraft from England for erection and machines from units in Egypt and Palestine for repair or striking off. Sadly, in June 1919, Maurice was hospitalised at Aboukir Hospital with double pneumonia. He died on 25 June 1919, aged just 18 years. 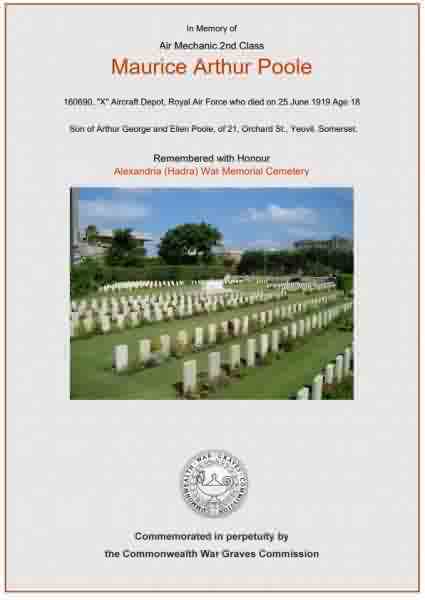 The Western Gazette, in its edition of 11 July 1919, reported "Official intimation was received by his parents on Saturday that Second Air Mechanic Maurice Arthur Poole, aged 18, younger son of Mr and Mrs A.G Poole of 21 Orchard Street, has died at Aboukir, Egypt, from double pneumonia. He had been in the Air Force a year last April, and Egypt about 11 months. It was only on Friday that a letter was received from the deceased dated June 17th, stating that he was well and hoped shortly to return home. Much sympathy is felt with Mr and Mrs Poole, especially in view of the fact that their elder son Private William Percy Poole, a telegraphist in the Northumberland Fusiliers died of enteric fever at Basra Hospital, Mesopotamia on Sept. 14th 1918, aged 20 years." Maurice Poole was interred in Alexandria (Hadra) War Memorial Cemetery, Egypt, Grave B.144, and his name is recorded on the War Memorial in the Borough. For details of Maurice's brother Percy, who died on 14 September 1918, - click here. 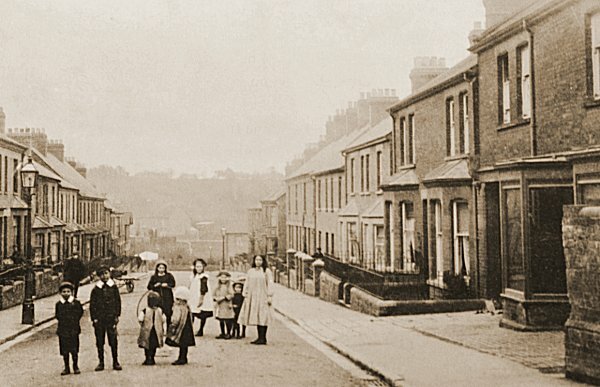 Orchard Street photographed from near the junction with Huish, around 1895 - when the Poole family lived at No 26. The Commonwealth War Graves Commission certificate in memory of Maurice Poole.